The 4 events celebrating the Buffleheads’ timely arrival and the launch of Sidney’s Naturehood made the news locally and in our country’s capital. B.C. Lieutenant-Governor Judith Guichon addresses students at Parkland Secondary in North Saanich Oct. 16. She spoke of the positive effect stewardship of nature can have on an entire community. A lone female Bufflehead duck was spotted by an avid bird watcher on Oct. 15 — the very day when the little sea duck is expected. Every 298 days, says Bufflehead guru Kerry Finley, the duck makes its return to Vancouver Island for their winter stay. It’s a record of punctuality that Finley has been studying for years from his home on Roberts Bay in Sidney. Its record of being on time (even within a day or two) surpasses that of the more famous Swallows of Capistrano, Italy, Finley said. He added that the return of the Bufflehead is even more consistent than the result of groundhog day. “We’re privileged to have this bird here,” he said Oct. 15 at Roberts Bay, marking All Buffleheads Day on the Peninsula. All Buffleheads Day is designed by the Friends of SHOAL Harbour (FOSH) to help raise awareness about the sanctuary and the impact human growth has on bird and marine life. 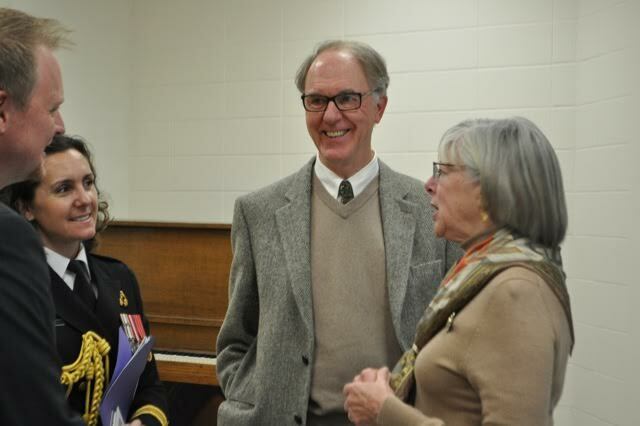 Part of this year’s event saw the arrival of B.C’s Lieutenant-Governor, Judith Guichon, who presided over a ceremony at Parkland Secondary School on Oct. 16. Guichon, who is from the province’s interior, noted that the Buffleheads make stopovers at her ranch during the summer, so coming to where they winter completes the circle. Guichon and Alex MacDonald of Nature Canada also heralded the official start of a program called Naturehood. Sidney is one of seven communities across Canada (including Regina, Montreal, Ottawa, and Fredericton) where Nature Canada has found partners to help reach out to the community. Partnering with FOSH, Naturehood is designed to teach people, mainly youth, about green spaces and wildlife in urban areas. “Naturehood brings nature right here, where we live daily,” said Guichon. She added that the choices people make every day — from recycling to other environmental issues — make a difference to urban nature. MacDonald said nature is not only found in parks or after taking long drives or hikes into the back country. He said that Naturehood shows people where to look and how to enjoy it and take care of nature locally. “There can be no end to fascination, once you start looking, he told an audience of students at Parkland. In Sidney, the Naturehood program is being co-ordinated by Tina Kelly, in partnership with FOSH. The program was announced earlier this year, but last week’s All Buffleheads Day events marked their official start. Parkland Principal Lizanne Chicanot told the students that everything they do can influence something else in the environment. Guichon took the opportunity to talk about her Stewards of the Future program, which she hosts each year at the Pearson College of the Pacific. She said this program brings youth from across the region together to discuss topics on the environment — from mining and regulations to decisions made by all levels of government. Guichon said that her program, in brief, looks at the three Rs — relationships, respect and responsibility. Sidney’s Roberts Bay is part of the Shoal Harbour Migratory Bird Sanctuary, which lies along the shoreline of the east side of the Saanich Peninsula. The sanctuary was created in the 1930s, and helps to protect and raise awareness of the Bufflehead and other bird species. MacDonald said Nature Canada is happy to be working with FOSH. “We recognize this opportunity to promote the migratory bird sanctuary, migrating birds and other species,” he said. MacDonald added that Naturehood will help people of all ages to appreciate what the area has in nature, how to enjoy it as well as how to protect it.